Take a trip back to the Ming Dynasty with Playtech on this three row, five reel machine. 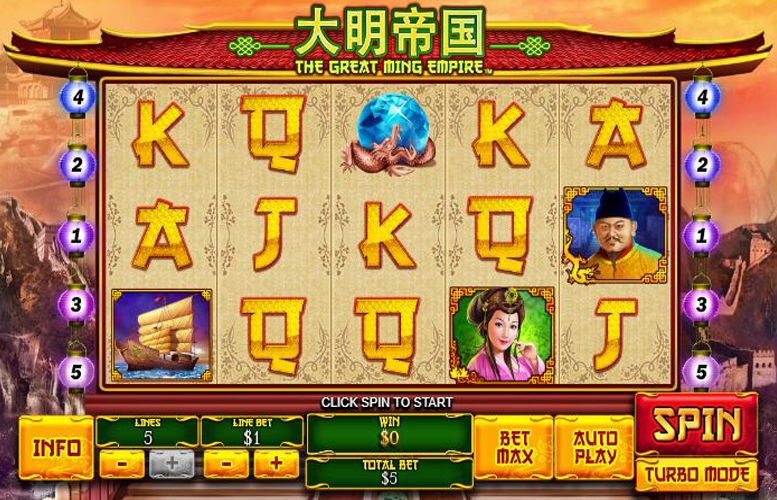 Like many Eastern themed slots these days, The Great Ming Empire slot machine has pairs of win lines which run in either direction, rather than simply left to right. In addition, there’s a particularly juicy bonus stage which can result in some colossal wins. That said, there is only one such special feature, and as such, the game begins to feel old rather fast. Visually, it’s a solid offering but it does lack the character which other machines achieve the use of creative art styles and symbol animation. Potentially huge instant win bonus round. Triggering the stage with five scatters and uncovering the higher value prizes will result in massive wins. Multidirectional win lines. The inclusion of pairs of win lines gives The Great Ming Empire slot machine a different feel, even if this quality is short lived. Not suitable for the highest rollers. Whilst most players will find the maximum bet per spin of £500 more than sufficient, those who came to play for the big money will likely find it limiting. Keep in mind that there are some slots that allow wagers of 4x this figure. Despite it being a potentially lucrative bonus round, The Treasure Room Bonus isn’t the most exciting feature out there. If it was the machine’s second bonus stage, it’d be great but whilst the game lacks any free spins or other ideas for features, the round doesn’t engage players sufficiently. “Wild” pagoda = 2,000x the line bet. Ming = 1,000x the line bet. Princess = 500x the line bet. Ship = 250x the line bet. Note: The “wild” pagoda symbol only substitutes for the Ming and Princess icons. In addition to the multidirectional win lines mentioned earlier, there is only one real bonus feature on The Great Ming Empire. Whilst the game is a little limited in this department, the “Treasure Room Bonus” can be very lucrative indeed. There are three different “scatter” symbols in The Great Ming Empire. 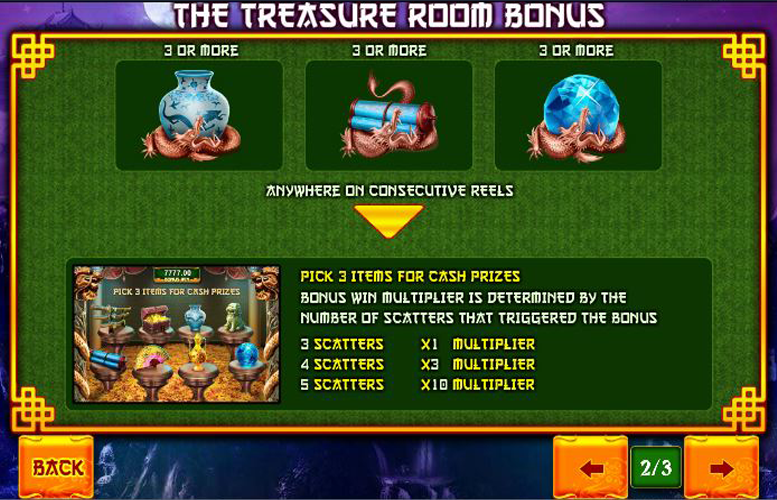 Hitting three or more of any one type of “scatter” on consecutive reels will trigger The Treasure Room Bonus. During this feature, players must pick three items. Under each one is a cash prize that is awarded instantly to them. 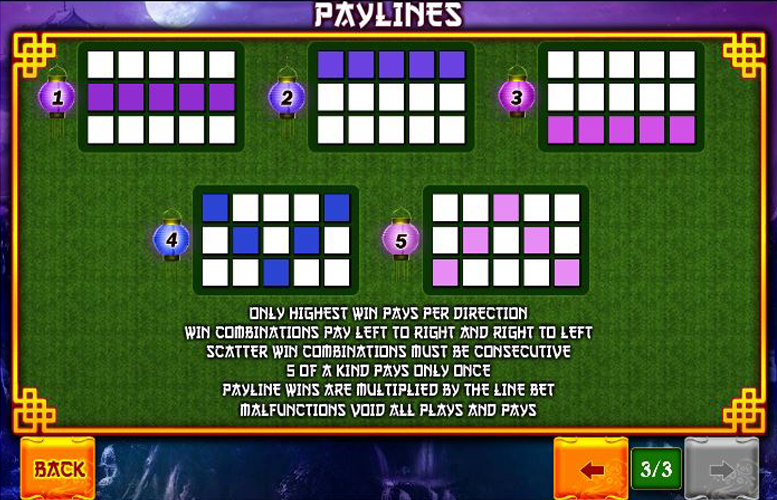 In addition, a bonus multiplier will be in effect if four or five scatters triggered the bonus in the first instance. Four scatters will result in all winnings being multiplied by three, and five scatters will result in bonus prizes being multiplied by ten. 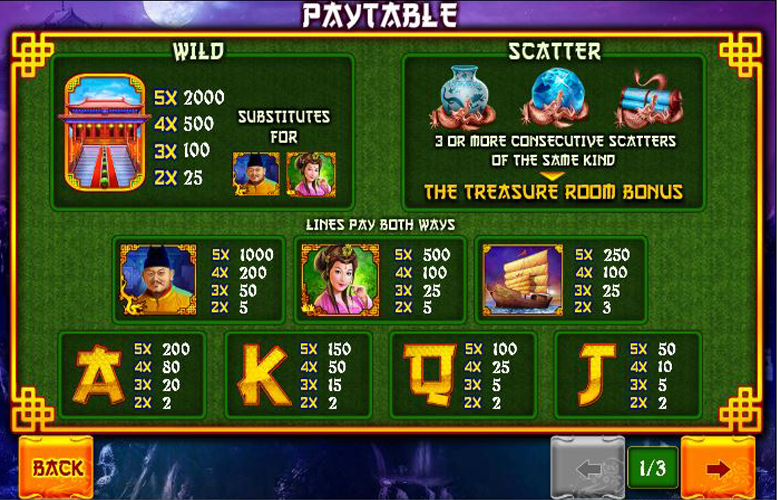 Each win line is in fact a pair of win lines on The Great Ming Empire slot machine. Each of the five run both left to right, and right to left. This small feature makes a change from the standard single directional win lines but it quickly loses its novelty. This title could use a proper second game feature. Ace = 200x the line bet. King = 150x the line bet. Queen = 100x the line bet. Jack = 50x the line bet. Players can adjust the number of win lines they play on (between one and five) and the amount bet per line. Here the variables range from 1p to £100. Since all win lines are pairs, it only costs the player once to use that win line. Therefore, if they were to place the minimum possible bet (1p on one win line), they would only pay 1p per spin. Conversely, if they were to use all the values set to their absolute maximum, each spin would cost £500. Whilst the upper limit isn’t bad, it’s not going to excite the very highest rollers out there. All told The Great Ming Empire slot machine is a solid one. It’s by no means the best machine out there but it doesn’t have too many pitfalls and is more than playable. The bonus stage is potentially very lucrative but doesn’t offer quite the same interaction enjoyment as many of its peers do. The artwork is solid although not particularly head-turning, and the action is good on a first play. Unfortunately, the lack of variety in gameplay could limit the number of repeat customers the title has in the long term. This game has a rating of 3 / 5 with 743 total reviews by the users.